Increase attendance at your college events! Find out why Programming Boards across the country consider this book to be the Bible of event promotions! Brian Brushwood and C.J. 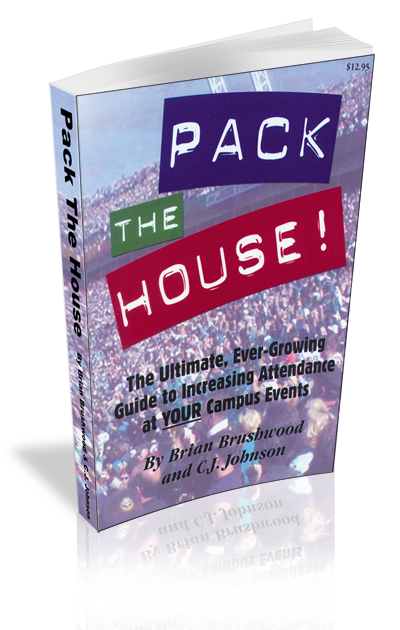 Johnson can help you take your on-campus marketing to the next level when you host their intensive 60- 90 minute workshop on “Pack the House - The Workshop to Increase Attendance at YOUR Campus Events”. The authors of this exciting book (now in it’s sixth printing, and available as an eBook) will work, one on one, with your programming board and explore different campus marketing strategies with you and your fellow students. The workshop begins with a look at 32 creative strategies and over a hundred specific examples of those strategies in action, and ends up with a brainstorming session applying those strategies to the specific events you have coming up on your campus. The workshop includes up to 30 copies of “Pack the House” (a $350+ value) and the presentation/workshop by authors C.J. Johnson or Brian Brushwood. The cost for this workshop is minimal, especially when you consider that putting these tools to work can double (or more) your typical attendance at events. Team up with other schools in your area and split the costs. Invite all campus organizations to the show & maximize your budget! Additional books are available during workshops at great discounts. To inquire about workshops or order additional copies of “Pack the House” call C.J. 's office at 800-462-4424. If you'd like to order a copy of the book "Pack the House" visit the products page.